Vietnam’s largest technology company may get a boost from a free trade deal brokered at APEC meetings in Da Nang this month to replace the Trans-Pacific Partnership. Eleven countries meeting at the APEC summit in Da Nang, Vietnam, agreed to seek a trans-pacific free trade agreement, despite the world’s largest market - the United States - pulling out of the deal. 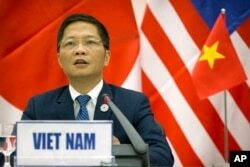 "On the basis of the results of four rounds of negotiations, ministers, over meetings in the last few days in Da Nang, have agreed on some important contents including an agreement of a new name for TPP with 11 members, the Comprehensive and Progressive Agreement for Trans-Pacific Partnership (CPTPP),” announced Vietnam’s Trade Minister Tran Tuan Anh Saturday. The re-vamped trade deal came after President Donald Trump withdrew the world’s largest market - the United States - in favor of bilateral agreements. Vietnamese Trade Minister Tran Tuan Anh speaks during a press conference about the Trans-Pacific Partnership (TPP) held on the sidelines of the Asia-Pacific Economic Cooperation (APEC) Summit in Danang, Vietnam, Nov. 11, 2017. When asked about unfair protectionism as a barrier to free trade - a reason Trump cited for pulling out of the TPP - Truong Gia Binh, the chairman of Vietnam’s largest technology company FPT, replied optimistically that the U.S. was a country that promotes freedoms and independence and free trade. “I strongly believe at [a] certain point [the] U.S. will be…gonna come back to discuss strong commitment for growth. And, I think that’s gonna be the way America goes as the leader in the world,” said Binh in an exclusive interview with VOA. Vietnam is expected to be one of the biggest beneficiaries of freer trade as it expands rapidly growing exports, including technology. FPT in April opened a sprawling new complex in Da Nang as it grows its operations at home. Speaking at the complex, Binh touted the importance of free trade. “Actually, I think that’s very important for Vietnam – not only open to the world but also to improve the regulations for trading and manufacturing and make Vietnam more international,” he said. Technology is one of the sectors expanding in Vietnam the quickest. “IT is a very fast growing (industry). For domestic, we normally got 15 percent (growth) annually. For export, we normally get 25 percent per year,” says Binh. 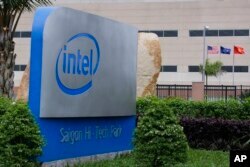 Intel and Samsung are among some of the biggest investors in the country, noted Binh. Intel in 2010 opened a $1 billion chip factory in Vietnam while Samsung manufactures half its mobile phones here and, by some estimates, accounts for about 20 percent of Vietnam’s exports. Free trade and investment are helping drive Vietnam’s economy - growing more than 6 percent per year - among the fastest four in Asia. Vietnam has regional and bilateral trade deals with a number of its neighbors, including South Korea and Japan. A trans-pacific deal, even without the United States, would only further boost the economy as Vietnam looks to trade more with its Asia-Pacific neighbors. FPT has no intention of missing out on the global, digital revolution. “Vietnam was late for (the) last three industrial revolutions. And a fourth industrial revolution is the only one maybe that is the last chance for Vietnam catching up with the world,” he said.